nothing too exciting going on here this week, just the usual horseback riding everyday. of course, since that's what i've wanted to do my whole life, i guess that's pretty exciting :) the forecast's calling for rain on my lesson day again... i don't know what the weather has against Wednesdays! today's polish is Hard Candy Sparked Up from their Glitteratzi collection, which i layered over Hard Candy Shot Of Lemon (both of these polishes were kindly sent to me for review!). 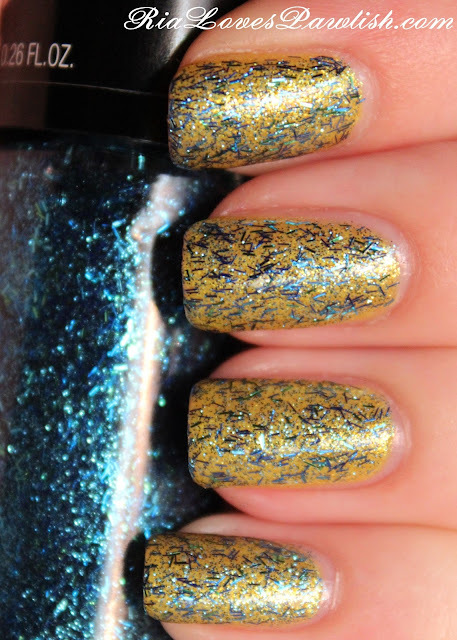 Sparked Up is chock full of tiny blue bar glitter and micro-glitter, all in a clear base. it's really easy to work with and spread evenly over the nail with minimal effort... i only needed one coat for great coverage! this is one that would be quite difficult to build up to complete opacity. i added a shine topcoat over everything to seal it all in and bring out all the sparkles! one coat Sparked Up, one coat Seche Vite, both over my Hard Candy Shot Of Lemon mani. These look really cute together.